So I wanted a way I could keep up with my housework without 1) letting everything just build up and be a mess till my next day off and 2) not using the entire said day to clean and polish just to be undone 5 minutes later. Viola! The chore chart was born! This chart lets me do a little each day so that it stays relatively clean without requiring any overhaul work on those precious off days. This chart is my actual version that I use on a daily basis to keep things in line. You can use it as a guideline and change the squares however best suits you. My schedule rotates every two weeks with some days off during week 1 and every other weekend off. If you work 5 days on/ two days off your chart might look a bit different based on what you want to do when. 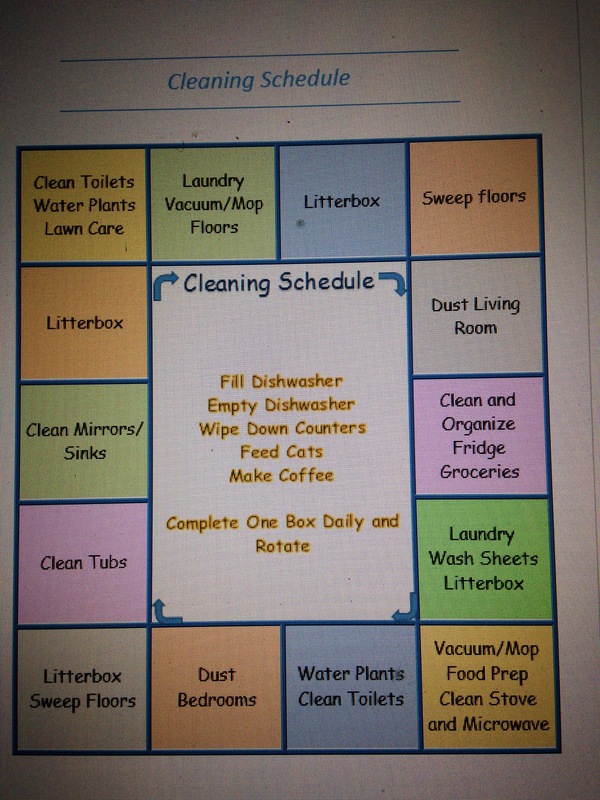 This is just a starting point but feel free to adapt it as you like to make cleaning a little less of a chore and your days off a little more enjoyable! This entry was posted in Keeping House. Yes I do this too but a little different…it really helps if I do what I am scheduled to do 🙂 Glad to see I am not the only one. Mine is by days of the week in hopes that spending 5 minutes a day on some small things will keep me from having to spend an entire weekend day on housework. Yes, that’s the main thing: no days where you are stuck doing a weeks worth of chores!